Gravity Flow version 1.1.3 is now available via auto-update and for download from the account page. In addition to fixing some bugs, this version and adds important new features such as step expiration and the Revert button in the Approval step. The Approval and User Input steps can now be scheduled for expiration. Once a step expires the entry will be sent to the step configured in the Next step setting(s). The Expiration settings in the Approval Step allow for the status to be specified once the step has expired. The Approval Step now has a Revert setting which will activate a third option in addition to Approve and Reject. The Revert button allows the assignee to send the entry directly to a User Input step without changing the status. Enable this setting to show the Revert button next to the Approve and Reject buttons and specify the User Input step the entry will be sent to. The Revert setting will only appear if the workflow has at least one User Input step. Once enabled the Revert button will appear on the workflow detail page next to the Approve and Reject buttons. – Added support for the revert button in the Approval Step so entries can be sent to a User Input step as a third alternative to “approve” or “reject”. 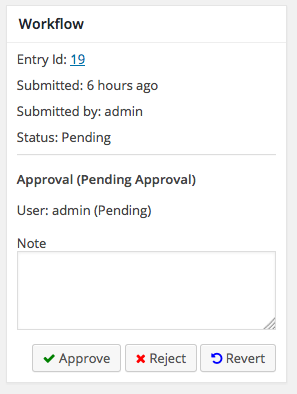 – Added the expiration setting to the approval and user input steps. – Added the username/step type to the timeline notes classes to allow certain note types to be hidden using CSS. – Updated the timeline to display the step icon when a user avatar is not available. – Fixed an issue with the column header texts where the inbox and status pages use different terminology.